As we move into the new club football season, Outside of the Boot will be publishing regular Tactical Previews of the sides from across Europe’s top seven leagues. The second one in a long list is of defending Premier League champions, Manchester City, led by Manuel Pellegrini. 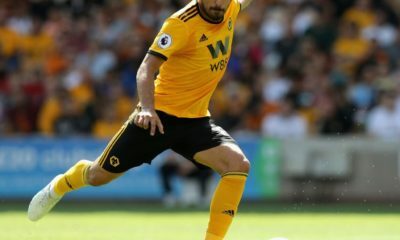 Sid Chaurasiya takes a look at their basic formation, analyses their tactics, key player and their potential key young player of the 2014/15 season. Manchester City will be hoping to become only the third team to successfully defend the Premier League title come next season, and with the squad that Manuel Pellegrini has at his disposal, its surely a conquerable target. Formation | How will they set-up? City will continue with their free flowing, attacking and fluid 4-2-2-2 for most part of the season, usually consisting of one #9 (Negredo/Dzeko) and one complete striker (Aguero/Jovetic) upfront, two interiors, a dynamic double pivot of Yaya Toure-Fernandinho and full-backs bombing forward at every opportunity. However, such a setup left City too exposed on the break last season and much of the cracks were covered up by the exceptional goalscoring form of the strikers and Yaya Toure, and the relentless dirty work by Fernandinho. The recent acquisition of Fernando indicates Pellegrini is looking for a more pragmatic setup especially for key matches and the Champions League. It’s expected that City will move to a 3 man midfield for Champions League fixtures and crucial games, with Fernando sitting behind Yaya Toure and Fernandinho, screening the backline. 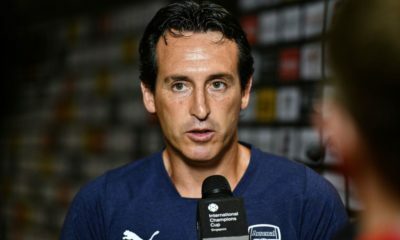 Analysis | What can we expect from them tactically? Joe Hart rarely ever had a genuine competition for his spot in the team, either at club level or at country level. This time around at club level, he will have Willy Cabellero, one of La Liga’s best goal-keepers in the past couple of years, breathing right down his neck. Joe has shown signs of cockiness in the past, and the signing of Willy is essentially to keep him on his toes throughout the campaign. Since Hart was dropped after the infamous goof up at Stamford Bridge back in October last year, he has shown improvement in form and is still a good shot-stopper but there are still few apparent flaws in his game. Hart’s distribution is very poor; decision making is dodgy (when to come off his line and when to retreat back); gets beaten at his near post often (unacceptable for any goalkeeper). Along with being a great shot-stopper, Cabellero’s footwork is much better and distributes the ball really well (gives an opportunity of a quick break immediately after defending a set-piece routine). At City, it will be a test of Cabellero’s concentration, how he deals with the crosses and his decisiveness. Pellegrini is said to be not fully sold on the England’s #1, though it is still expected Joe will remain City’s first-choice at least for the start of the 14-15 season but there’s a good possibility of Cabellero taking over the spot by Christmas. Full-backs play a crucial role for Pellegrini’s style of play. They provide width to the attack and by staying in the opponents half remain a passing option and help create overloads in the wide areas (usually Kolarov remains high and provides width while Zabaleta stays in line with the deepest midfielder). Aguero, Jovetic, Dzeko and Negredo are excellent at attacking crosses and shifting across to deposit the pull-back into the back of the net; and Pellegrini uses the full-backs to a great effect to make the most of this quality of the strikers. 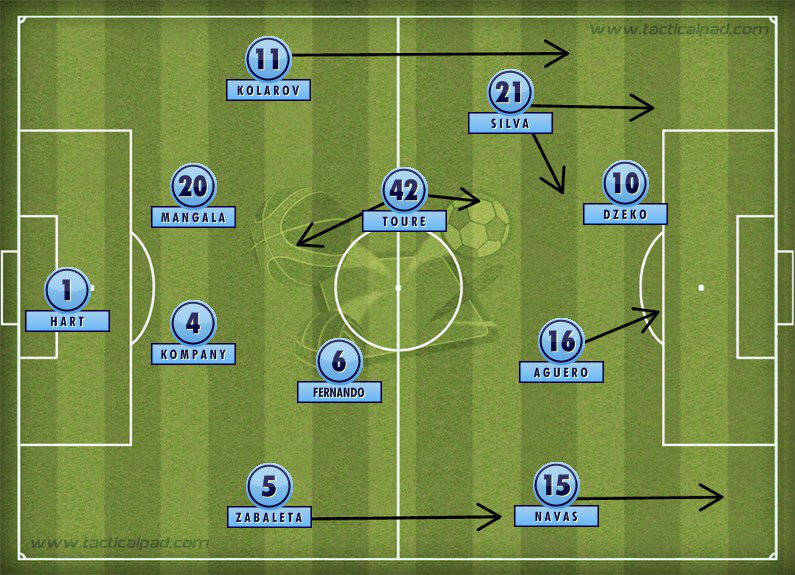 Manchester City scored around 45 goals from a cross or a cut-back, most of which came from the overlapping full-back. Pellegrini rotates the two left-backs, as per the opposition; Gael Clichy (being the better defender of the two) is preferred in away matches against bigger opposition (starting at Stamford Bridge, White Hart Lane, Old Trafford, Emirates, Anfield, Goodison) while Kolarov (excellent crosser) is preferred in home games against bigger opposition (started at Etihad vs United, Liverpool, Everton and Chelsea) and against narrow teams. Expect a similar rotation between Zabaleta and Sagna. Sagna was one of Arsenal’s most reliable player in the last 7 years, and can double up as a centre-back if the situation demands so. While Sagna may not be able to make those tireless overlapping runs like Zabaleta, he’s excellent defensively (probably the best 1-v-1 defender in the team) and manages to get a good shape on his crosses. Kompany-Mangala will be the first choice centre-back pairing for the next season, but it will be interesting to see who plays the role of aggressor and who drops off. Vincent, even though originally a midfielder, struggled a bit defending higher up on the pitch (still an excellent penalty box defender) while Mangala is a safety first kind of central defender with a remarkable leap and good pace on him as compared to his physically intimidating presence. Demichelis got a lot unwarranted criticism last season, mainly directed at his lack of pace, but he’s a vastly experienced defender who holds the line really well and is an expert reader of the game. The Argentine was also useful for City’s set-piece routines especially in corners, usually being the one making a run towards the front post to provide the flick on. Nastasic, who had problems adjusting in a highline, will be the understudy for new signing Mangala. Yaya-Fernandinho forged together a very good partnership last season, with Fernandinho, a naturally box-to-box midfielder, playing in the deeper role while Yaya having the freedom to roam forward and carry the ball in more advance areas, directly linking up with the strikers and trying to pull the opposition’s defense out of shape for the creative players to exploit that gap. Fernandinho had an excellent season, arguably City’s most consistent player in the last campaign, but being a naturally box-to-box player, he doesn’t possesses the tactical and positional sense of an out and out defensive midfielder. City’s expansive style of play meant many a times both Yaya and Fernandinho were found out of position. In Fernando, City have a player a defensive midfielder who will rarely cross the halfway line but will harrow down and win the ball as soon as an opponent enters his half. His range of passing might not be diverse, but Fernando makes sure he keeps things simple. He will provide a proper guard to City’s backline, will man the edge of box to clear pull-backs, defend the wide areas and will help wining the 2nd balls . A lot will depend upon the former Porto man, if City are to progress deep in the Champions League. 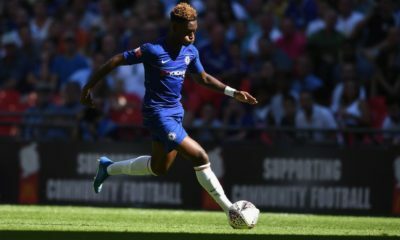 New signing Zucuclini (loaned to Sunderland till January), will be the 4th choice midfielder replacing Lampard when the former Chelsea’s man loan spell ends. The young Argentine is a tenacious box-to-box midfielder, someone who wouldn’t think twice to go in for a 50/50 challenge and is blessed with a great engine and a diverse passing range. Manchester City scored a record breaking 156 goals last season , and it wouldn’t had been possible without the service provided by Silva, Nasri, Milner and Navas. In Silva and Nasri, manager Manuel Pellegrini has two outstanding interiors who are as good a creators as anyone else and players who are excellent at ball retention. When out of possession, Nasri does a lot of tracking back to help the fullback while Silva’s ankle problems means he can’t run as much but does his share of dirty work by making tactical fouls to stop the counters. Navas gives a new dimension to City’s attack being the most direct option in the squad. An old fashioned winger, he will take on the left-back and swing in a cross, usually staying high and wide to provide width against teams that tend to play extremely narrow. While Milner offers a great deal of defensive discipline, it will be wrong to label him as only a workhouse. His understanding with all the offensive players in the team, especially with Silva, means he’s always a threat (Anfield and Allianz Arena), always involved in the buildup of the moves (only Navas and Yaya made more assists than him last season), at the same time ready to provide cover defensively for the fullback. Every team needs a James Milner in the squad. A strike force of Sergio Aguero, Edin Dzeko, Alvaro Negredo and Stevan Jovetic is a manager’s dream, with those four scoring 83 goals combined in all competition last season. Aguero is the undisputed first choice striker, usually paired with a number 9 upfront, who would occupy the defenders while Kun would make runs in behind (linking rather brilliantly with Negredo in the first half of last season). Jovetic had a very frustrating last year but seems to have put all the disappointment behind, having had a very good pre-season impressing everyone with his nimble footwork and well taken goals. Pellegrini has said in the past that he sees Jovetic as a striker and also an attacking midfielder who can replace Nasri or Silva. Other than putting an end to the crosses, Negredo and Dzeko provide presence in the box, along with holding up the ball and bringing others into play. Dzeko divides opinion in City’s fan base but has a knack of scoring extremely crucial goals irrespective of his performance in that match. Negredo had a tendency of having a season of two halves at Sevilla, and his first season in Manchester was no different, bullying the defenders and scoring some exquisite goals in the first half of the season while going through a goal drought after a shoulder injury in the second half. Key Player | Who will be the stand-out player for the system? It is said stop Yaya Toure, stop Manchester City; and to an extent it is true. Much has been written about Yaya after the cake-gate, but he has since reiterated his desire to stay at Manchester for as long as he can in a recent interview. For a player who started as a centre-back in a Champions League final just 5 years ago to score 24 goals in a season is just an incredible feat. For all the criticism of him not tracking back and defensively casual nature, he’s a player who can change the game in a fraction of a second; the memories of this year’s League Cup final is still fresh. Because of his physique and his marauding runs, his excellent playmaking abilities goes very much under the radar. He picks runners from deep with his passes with mighty ease, and his over the top balls are a delight to watch. Another monstrous season from Yaya, and City are sure to pick up a trophy or two. 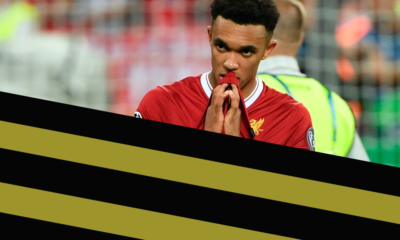 Talent Radar | Who will be the key young player this season? Nastasic is one of the best defenders in his age group, and under the right setup has the potential to become a world class centre-back. The Serbian had a season to forget, riddled by constant injuries and incompatibility in playing in a high line (reason why he has reportedly been put up on sale). Excellent reader of the game and rarely to make an error, he showed maturity beyond his age in his first season at City. His physique gives an impression otherwise, but he’s really strong and has handled physical strikers like Lukaku and Bony really well. If Nastasic is to leave City in this window, the club who signs him will be getting a gem. 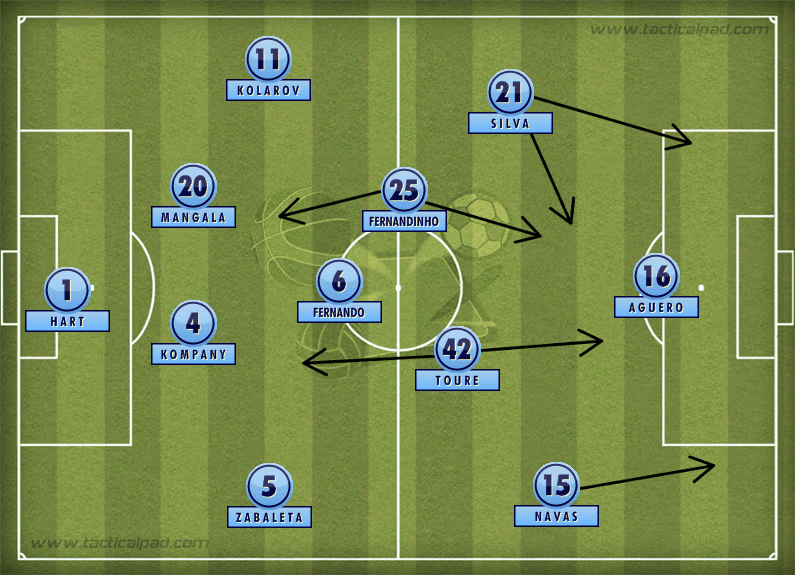 You can read all our 2014/15 Tactical Previews, and all articles in our The Invisible Men Manchester City blog.